Dance Routes research projects centred around two aspects of odissi’s background. The first aspect was the contribution of Odishan temple architecture and sculpture to odissi’s use of body and philosophical blueprint. 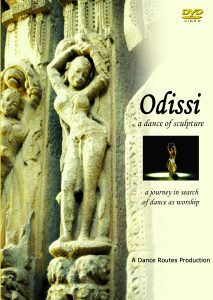 This resulted in a documentary video, exhibition, book and workshop entitled ‘Odissi – A Dance of Sculpture’. The second aspect centred on the folk elements that were borrowed for the creation of odissi’s classical movement patterns, music and repertory from the rural gotipua tradition. Under the name ‘Raghurajpur Lila Project’, it included workshops for the production of new choreography using acrobatics in conjunction with odissi movements, documentation of gotipua gurus from different allied disciplines, public lectures entitled ‘The Making of a Tradition’, and a series of workshops collectively called ‘The Dhara-Auroville Dance Encounter’ facilitating interactions between the gotipuas and children in Tamil Nadu. Dance Routes established a fund-raising arm called The Kai Trust whilst the company was based in Odisha, in order to support projects involving the gotipuas. 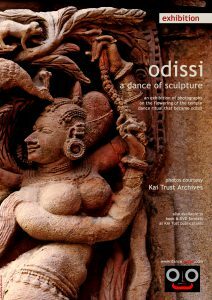 ‘Odissi – A Dance of Sculpture’ traces the evolution of dance as ritual worship in the medieval temples of Odisha, Eastern India. Using sculpture carved upon the walls of these ancient shrines, the story begins more than 2000 years ago in the early Jain caves of Udaigiri, and culminates in the magnificent 13th century temple of Konark where Odishan temple architecture achieved its final flowering. This 2-part documentary is a unique educational resource that follows in the footsteps of the pioneering work by Dr. Kapila Vatsayan, bringing together architecture, sculpture, religion and dance. It serves as a valuable contribution to the understanding of the inter-related threads of India’s cultural heritage. The DVD comes with an illustrated script and maps so that visitors to Odisha can make their own informed search of the ritual that inspired the creation of odissi in 20th century India. The exhibition also demonstrates how a significant coming together of different religious ideas documented by the temples’ iconography heralded the growth of tantra, where worshippers could participate in rituals and dancers, consecrates as devadasi, or the ‘servant-wives of God’, performed as a mortgage offering on behalf of the king and kingdom. The exhibition opened on 7th April 2010 for three weeks at the Gallery Square Circle, Bharat Nivas, Auroville. It was subsequently mounted at the Sri Aurobindo Ashram Exhibition Hall in Pondicherry in March 2011 for two weeks. Dance, as a temple ritual, occurred in Odisha without interruption for many centuries. The photographs in this book, with their accompanying notes, are used to trace this ritual by looking at the architectural and sculptural developments that took place between the 6th and 13th centuries AD. These milestones from the past mark how a religious environment developed where the dance ritual took centre stage in the community’s worship. All the sites described here are indicated in the maps drawn by Sri Rabindranath Sahu at the back of the book. These are in and around Bhubaneswar, so within easy access of the State capital. They allow for a first hand, informed experience of how these temple environments changed in form and detail, becoming grander and richer with each century as the dance tradition unfolded. Our focus has been on the gradual ‘coming of age’ of the sculptural languorous maiden (alasakanya) motif on temple surfaces. It was this image that inspired the physical shape odissi took when it was born in the 20th century as an Indian classical dance art. A description of the evolving temple structure, on which the motif appeared, required using some technical terms that appear in italics in the text, and have been explained in the Glossary section for easy reference. This temple body represented a map of the universe, and the idea of performing within a form viewed as the body of God has remained a source of inspiration for dancers even today. Indeed, embodying sacred space through dance is a dominant idea in the choreographic works that are being created across the odissi tradition. The photographs used are from the Dance Routes Archives, a collection made up of many years of audio and visual documentation of Odishan architecture, sculpture, painting, folk and tribal music, as well as other relevant materials to the study of Odishan dance history that was carried out by Dance Routes in Bhubaneswar. We would like to thank the Archeological Survey of India for granting us permission to take photographs. We were greatly helped in some of the temple photography by Robyn Beeche, who will always have our heartfelt gratitude, and by Dilip Dhirsamant, a Bhubaneswar-based photographer. Dance photographs are by Robyn Beeche, Lalit Verma, Avinash Pasrisha and Henry Stein. We would also like to thank Dharmesh Jadeja and his team for their support in mounting an exhibition of these photographs at the Gallery Square Circle in Bharat Nivas, Auroville. The exhibition drew its storyline from the DVD of the same title that was first published by Dance Routes in 2005, and this book further expands on the exhibition. It was the very warm response of visitors to this event that spurred the making of this publication. Lastly, readers should note that for this second print, the nomenclature of Orissa has been updated to Odisha, the adjectives Oriyan or Orissan to Odishan, and Oriya to Odia. Phase I (2005-2007) supported by Indian National Trust for Art and Cultural Heritage, East Zone Cultural Centre and Indian Council of Cultural Relations, New Delhi. The Indian National Trust for Art and Cultural heritage (INTACH) proposed an ‘Integrated Development Plan’ for the heritage village of Raghurajpur, located 15 kilometres from the pilgrimage town of Puri, Odisha. Among other development initiatives, the plan cited study and enhancement of the gotipua dance tradition as one of its objectives. INTACH initiated the ‘Raghurajpur Lila’ project (Phase I) – a five-month performing arts workshop designed and executed by Dance Routes to further solidify this objective. In the same month, the Eastern Zonal Cultural Centre (EZCC) Kolkata, with the Ministry of Rural Development SGSY (Special Project), Government of India, also agreed to support the project. The small village of Raghurajpur is famed for its rich artistic traditions and almost every home is an artisan’s studio. It was also the home of Padma Vibhushana Guru Kelucharan Mohapatra, a gotipua initially, who later became an internationally acclaimed dancer and a founding father in the creation of odissi. Due to INTACH’s efforts, traditional mural painting in Raghurajpur had been revived and the exterior walls of homes repainted with popular mythological stories. As part of the project, Dance Routes enlisted the help of Robyn Beeche, an Australian photographer, to document these as well as pattachitra paintings in the possession of indigenous artists. Phase I of the project was a five-month workshop with one young gurukul from the village of Raghurajpur. It explored ways of enhancing training for acrobatic movements amongst young children from the gotipua tradition, and introduced concepts of theatricality and presentation that were new to them. The workshop ended with much acclaimed performances of the troupe in both Kolkata and New Delhi. Guest choreographers invited to participate in the workshops were Guru Lingaraj Barik and Guru Maguni Jena. The ground covered by these presentations focused on the oral legends connected with the beginnings of the gotipua tradition in the 16th century; the development of the tradition’s present repertoire; the gotipua lineage of Raghurajpur and the process by which odissi transformed elements from the gotipua tradition into a classical Indian dance form. 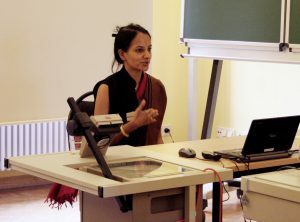 A dialogue was also started amongst gotipua gurus, and a consensus reached on how the gotipua tradition should take its art forward into the 21st century. Namely, by using acrobatic elements narratively, and improving skills in the fields of vocal music, percussion and dance. The invited tutors gave accounts of their life histories, as well as their contribution to the gotipua tradition. Excerpts from the production ‘Dhara’, highlighting both the connection between yoga asanas and acrobatic positions used by the gotipuas and a way to incorporate other folk traditions into a performance, were presented at the annual Basant Utsav in Raghurajpur on 10th March 2007. New choreography created during the project was presented to the village on the Bhuasuni Devi temple platform, built by Guru Kelucharan Mohapatra. This particular performance marked a significant milestone in that it was the first time dancers from different gurukuls within the village, as well as outside, had performed together. A detailed project report, including extensive video documentation of the workshops and presentations held in the village of Raghurajpur, along with learning tools for voice, mardala and odissi, have been put on VCD format and submitted to Ford Foundation India. The process of odissi’s birth using and transforming indigenous folk resources is discussed, drawing attention to the artistic creativity of odissi’s founders in post-independent India. It includes video interviews with individuals who witnessed this period, and who made personal contributions. The ‘Dhara-Auroville Dance Encounter’ was a collaborative project of the KAI Trust and Bharat Nivas, Auroville for which the KAI Trust received the Cultural Functions Grant Scheme, Ministry of Culture, Government of India. The project was conceived as an intensive one-month workshop in February/March 2011 that would not only introduce children and professional dancers from within Auroville’s master plan to the acrobatic skills of the Odishan gotipua dancers, but also to the unique odissi repertory created by Dance Routes that builds on yoga and gotipua skills. It was also an invaluable opportunity for the gotipuas to expand their worldview through interactions with Auroville and the philosophy of Sri Aurobindo. Rekha Tandon (odissi dance/choreographer/researcher); Michael Weston (audio-visual documentation/music composition); Purnachandra Maharana and Biswanath Jena (senior gotipua dancers and teachers who have trained in Dance Routes projects earlier). Karolina Szwed from Poland (dancer/gotipua researcher, currently training with Rekha) provided teaching assistance, especially for traditional bandha movements. Ana Costa, who had trained extensively in gymnastics in Portugal, and Terra Oxana Kafina, who had circus training in Russia, provided all participants an opportunity to try new acrobatic movements and marry them into the traditional gotipua repertory under the artistic direction of Rekha. The final performance was of one-hour duration. Innovative choreography that combined acrobatics, gymnastics, yoga and classical odissi dance was offset by Odishan pattachitra paintings and drawings used in back projections. The project provided an opportunity for in-depth sharing of worldviews amongst participants from different parts of the country and abroad. Tamil children from villages in and around Auroville had close interaction with Odishan gotipua artists and learnt movement skills. The visiting rural Odishan artists partook in the multicultural social and artistic environment of Auroville, as well as its philosophical ideals, and made friends with a wide section of people. The occasion provided an opportunity for highly skilled dancers from Portugal, Russia and Poland who were in Auroville to engage with local Tamil children and the visiting rural Odia artists, and to exchange worldviews and dance knowledge. The concluding performance showcased a tapestry of Odishan folk and classical dance skills in a high-quality production to Auroville’s cosmopolitan township.